Save Our Services Campaign in Newcastle – Boiling Up! 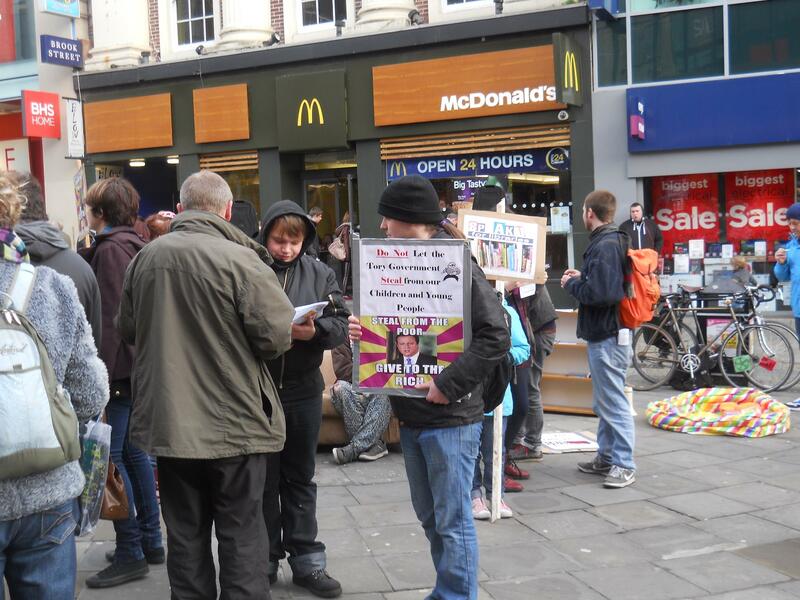 The Save Our Services Campaign on Tyneside hit the main street of Newcastle on Saturday, January 5. 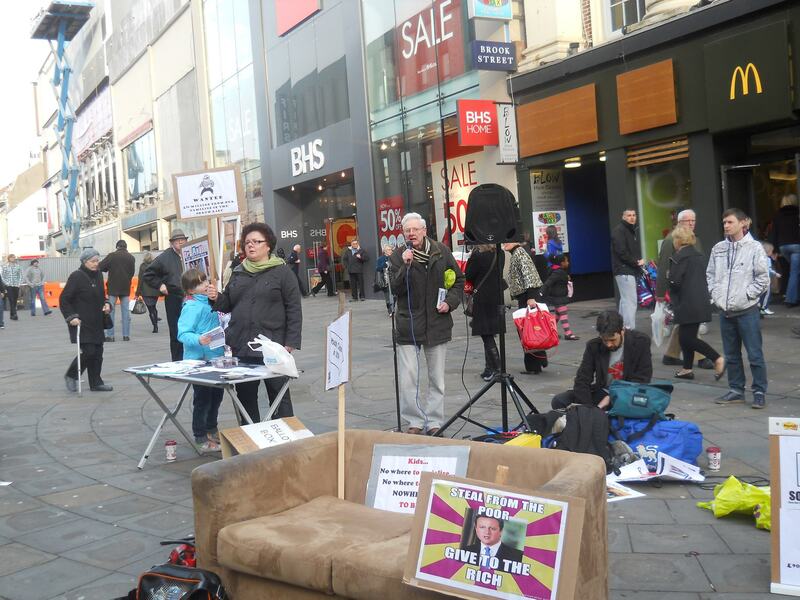 The Youth Work ‘installation’ on Northumberland St worked well and drew much interest. Lots of people signed the petition, took posters and leaflets and postcards to send to Councillors/MP’s and were very concerned, interested and wanting to know more about the likely impact of the cuts and how they would effect local neighbourhoods. Like one woman who had been a member of her local swimming club for 30 years and angry/despairing about the proposed closure of her local pool…she’s coming to the council consultation meeting at the City Library on Saturday January 12th with other swimming club members to lobby about the health, social, fitness benefits of her club. One man talked about having grown up in care and ‘gone astray’ but could see clearly how getting the chance to meet new people, gain support, confidence, skills and develop new opportunities through Youth Work had changed his outlook on life. He got into acting, drama and entertainment and eventually ‘back on track’. Lots of stories like these were told by people as they were signing the petition and having conversations with us. Young people took to the mike and rapped out their experiences and the benefits of youth work in their lives, entertaining the passers by. Several local journalists were interested and took many stories away..hopefully we’ll see them in the local press during the week…all going well and keeping up the momentum. SITTING alone in a paddling pool is what some people predict will be the future for kids following major council cuts. A street theatre protest took place in Newcastle city centre yesterday to raise awareness of the proposed cuts to services that will impact upon children, young people and neighbourhoods. It has been revealed that Newcastle City Council’s £90m cuts package has now increased to a staggering £100m. The council is being forced to close libraries, swimming pools and cut youth services. The protest was staged by the Save Our Services campaign group and was aimed at highlighting to shoppers what the group believe is the reality of what libraries, swimming pools and youth services will look like if the cuts are not stopped from going through. Schoolboy Jacob Manley, 10, took centre stage with his little sister Martha, seven. His mum Catherine, 43, a youth and community worker, of Consett, County Durham, also attended. Jacob said: “I think the council should not cut libraries and swimming pools for children. Now Jacob has got a serious sense of irony. ‘Boiling hot’ in Newcastle! Brilliant! And the protest was also covered in the Evening Chronicle on Monday, January 8 at Campaigners stage protest.